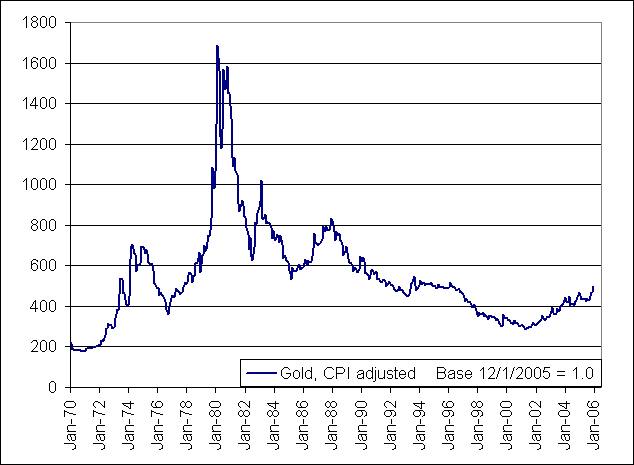 The prices of precious metals remain above their historical averages, adjusted for inflation: Gold is 54% above its long-term average; silver 1%; palladium 109%; and platinum 14%. Except for silver, the fraction of time they have been more expensive than currently, over the last 46 years, is small. This does not necessarily mean they are irrationally valued, but the price history alone supports only the silver price. Metals prices were taken from Kitco's historical data. Prices were inflation-adjusted using the consumer price index (CPI) for all urban consumers, taken from the Bureau of Labor Statistics' web site (under the “Databases and tables” tab, look for the “Inflation” heading). For both the CPI and the metals prices, and for each of the years 1969-2014, the annual average value was used where available; in the latest year the cumulative average metal price to date and the most recent value of the CPI were used..